Daisy is a nut. A lovable, adorable, sweet little nut. We call her our little peanut. But sometimes her nuttiness is dangerous to her, like when she charges at full speed across the kitchen floor and only puts the brakes on an inch away from the door frame or refrigerator, causing her entire body to crash into it with a bang. Her nuttiness was also the cause of her severe ACL/meniscus tear, when she jumped off a chair with such crazy excitement that she landed wrong and ended up in a world of pain…and in surgery. Ack! I don’t ever want to go through that again! So now we don’t let her jump off the furniture, we carry her off with us. She seems to like that. And we watch out for other ways she can hurt herself, like her flying slide across the kitchen floor. The solution – we put a long runner down across the kitchen floor, connecting the carpeted living room and family room. It may look odd, but now there’s no more slipping and sliding and Daisy seems to love it. 🙂 And hopefully we’ve avoided yet another emergency surgery. I love my soft runway! 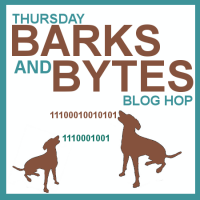 We’re part of the Thursday Barks and Bytes bog hop! Sounds like a perfect solution! OMG those sound like some nasty injuries! These little pups do tend to go with the moment and suffer the consequences later. Sometimes I feel like we’re always playing catch-up! That first photo says it all – love it! I think that is very smart. You really don;t want any more injuries if you can prevent them. Besides, I bet Daisy loves it! Thanks so much for joining the hop. She really does love it, Linda, and we don’t ever want to see her go through that kind of pain again. I think that’s perfect, and very pretty too. I think it looks fine and even if it didn’t, Daisy’s safety is priority number 1! I think it is a great solution for the problem. The runner is a good idea and very practical to keep her safe; I think it looks fine and it looks like Daisy approves too – and in the end, that’s all that matters! I’m glad I’m not the only one who chooses pets over interior design 🙂 Sounds like you found a great way to keep that sweet girl safe. BTW: runners for doggies are just chic: http://thechronicleofwoos.blogspot.hu/2013/11/saturday-showing.html! When it comes to the safety of our little sweeties how things look takes a backseat. I think the runner looks nice myself, I have never seen one that long. I am happy that Daisy is liking her new runway. What a little darling and so cute. Hope you all are doing well. Thanks for stopping by and commenting on the slugs. I am always thrilled to see you have been to the blog. Love, hugs and nose kisses from all of us to all of you. 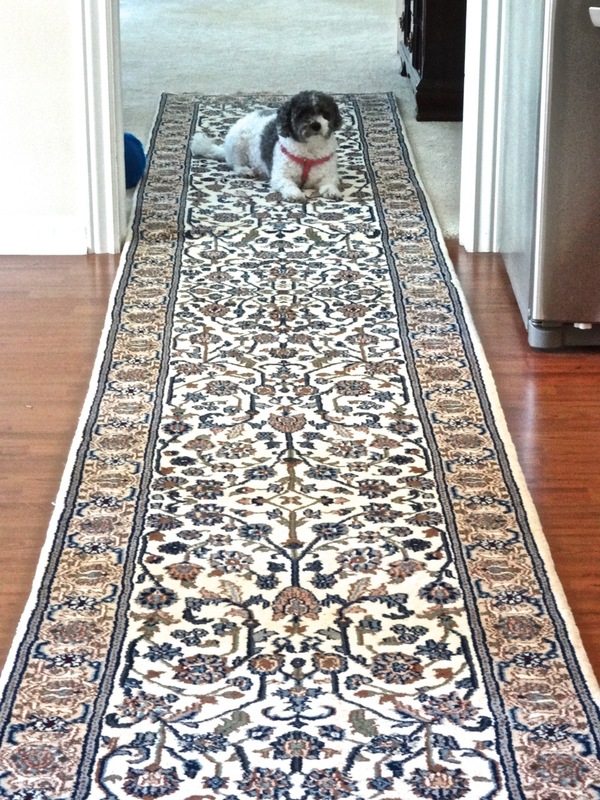 When you have dogs, all thoughts of beautiful and perfect home decor have to go out the window (though that is a very pretty carpet runner)! I’ve always hated carpet and loved wood floors, so we slowly converted most of our house to wood floors and stairs. Now we have throw rugs, carpet treads, and whatever else it takes to keep the dogs from slipping and sliding! Live and learn…LOL. you are right, much better to be safe and that runner is beautiful! Happy to meet you! Found you over at http://talesfromthebackroad.com/ and I am glad that she linked to you, because now I am one of your newest followers! Hi there! 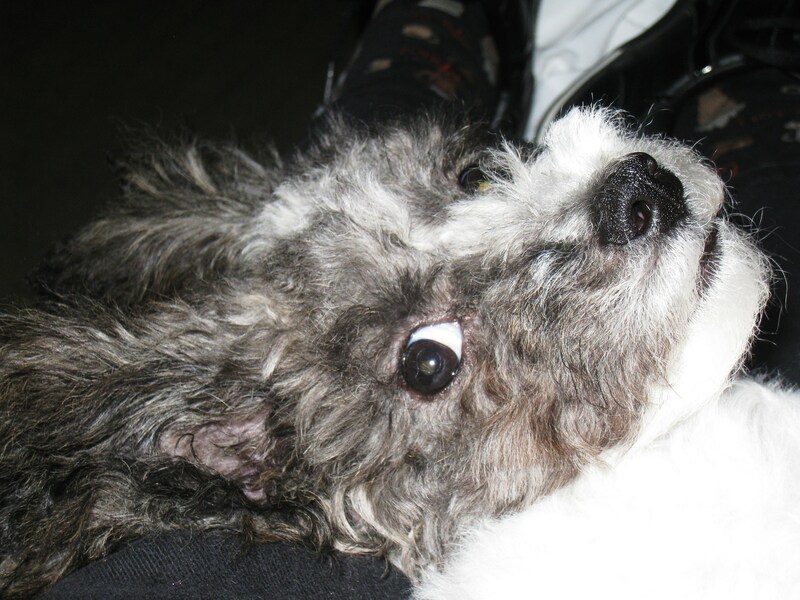 I am popping over from Mary’s blog too…especially interesting to me because I have bichons! My girls had a lot of trouble with their knees…luxating patellas, etc. We certainly understand RUNNERS!! We put all new floors in the cottage and then discovered that it was a very bad idea because the girls kept slipping and sliding all over the place. We purchased a package of those foam squares that many people use in kids’ playrooms and it has worked well…although does not look that good!! Safety first … as we all say! Nice to meet you!